I have experienced typhoons in Japan, hurricanes in Texas and lightning in a snow storm in New Jersey, but nothing like the electrical storm we had this week in Bacalar, Mexico. This was a doozy. The evening started with quiet flashes and increased breezes coming from the north. Only because we had just installed hurricane curtains on our screened-in porch, did we close up the house and head to bed. Might as well give these puppies a go. Lord were we in for a night! An example of some of the storms that roll across the Laguna. It wasn’t long before the storm hit. Blinding flashes exploded one after another followed immediately by ear splitting sonic booms which told me that the storm was stalled right over us. My father had taught me to count, one-thousand one, one-thousand two, between lightning and thunder claps to track the storm’s movement. It was right on us and I was glad for the concrete bunker that we live in and our newly installed protection. I badly wanted to go up on the roof to watch the storm, but frankly I was scared. Mexico leads the world in death from lightning (National Lightning Safety Institute) and I wasn’t about to be stupid. The lack of grounding wire in many homes in Mexico is likely the culprit, not to mention the spaghetti bowl of dangling wire that can be seen all over most cities. I checked on the dogs who seemed to be doing quite well considering, battened down the hatches some more and climbed into bed. I fell asleep counting one-thousand one, one-thousand two, as the storm slowly moved away. NOT taken during the storm. The next morning our yard looked like it had been through a spin cycle. Two banana trees came down with their top-heavy load of green bananas, lots of leaves, and a few big branches was all. We had gotten a much needed drenching and overall faired pretty well. It took a few days but all is back in order. Next time I will take pictures. 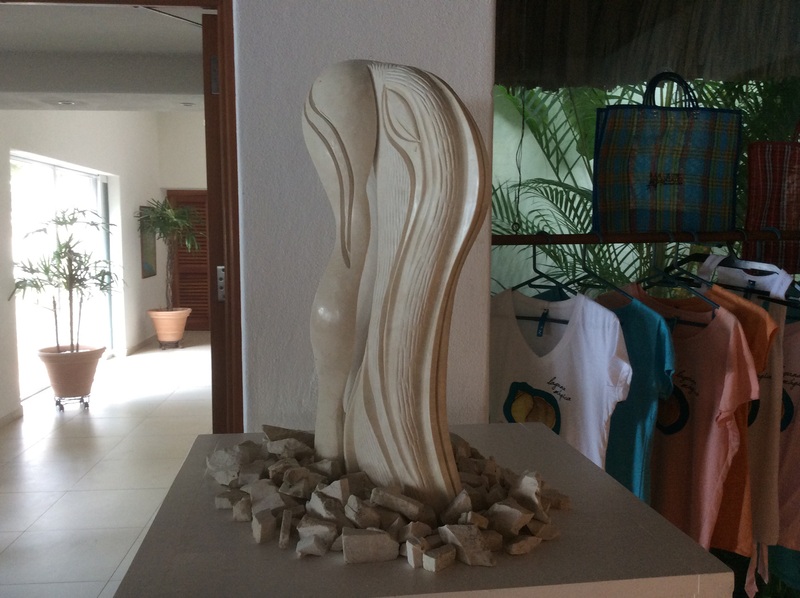 “Art has so many sides, so many possibilities.” These wise words posted by one of our blog followers inspired me to continue sharing the artistry that is Bacalar. Christmas Eve we met our neighbors Abraham and Isabel. 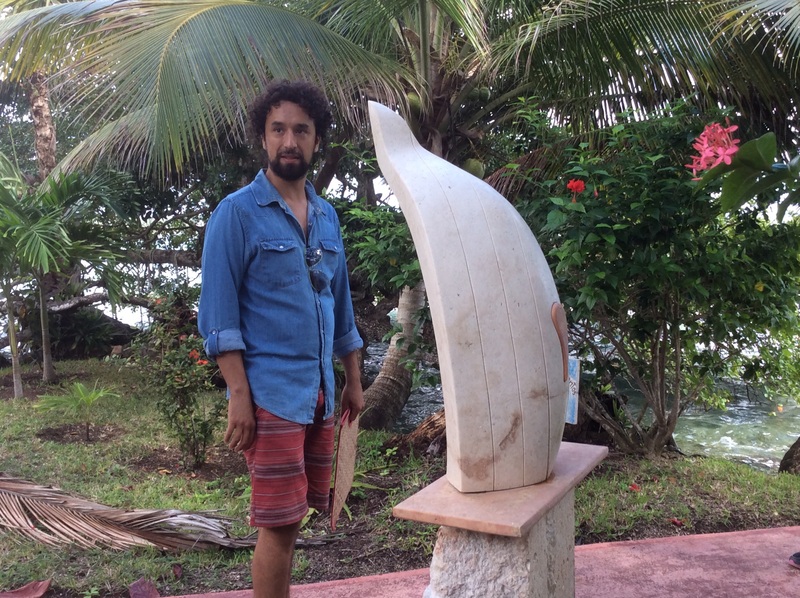 Abraham is a stone and wood sculptor with his work currently on display at a local resort. We spent a fun day recently oooing and ahhhing and generally being inspired by Abraham’s work. 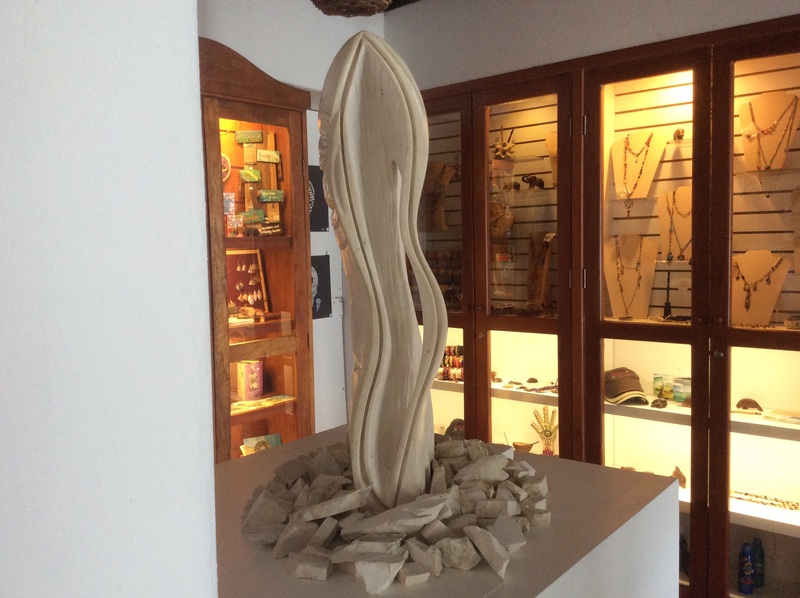 The pieces are viewed best by walking round to experience all sides. Clearly this is not the perfect venue. The stone makes you want to caress the coolness, smooth and rough. 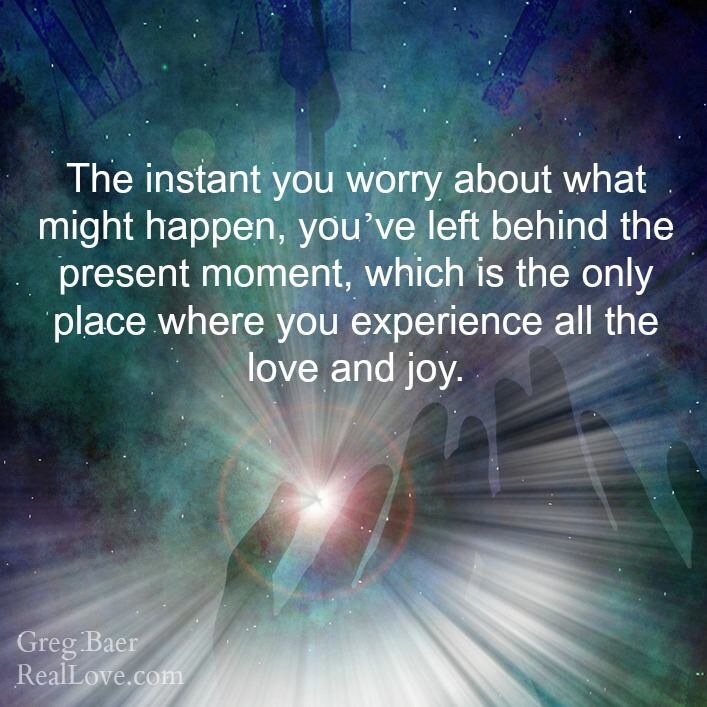 Abraham “finds” stones, or maybe they find him and works to release the beauty within. 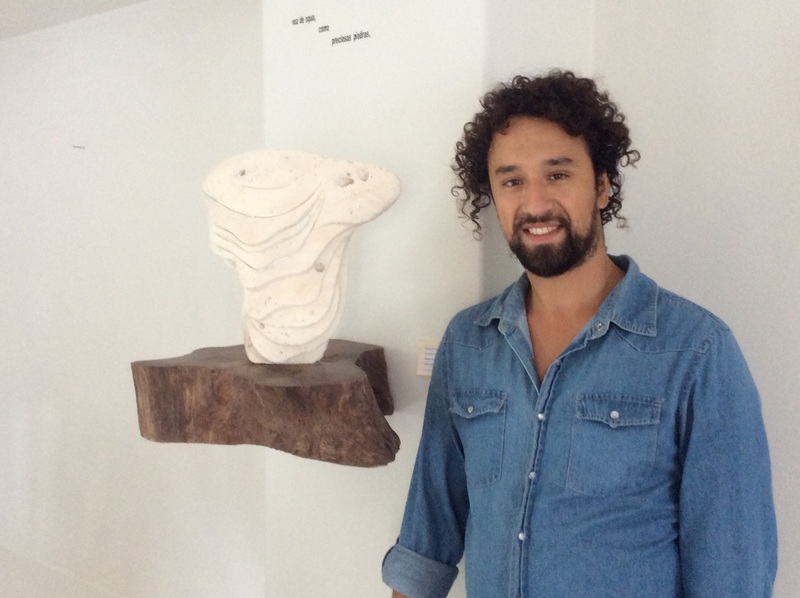 Abraham is working on an installation for the Modern Art Museum in Mexico City in a few months. At the same time, all pieces are for sale, a common struggle of all full-time artists. Wouldn’t this beauty look wonderful in your garden? 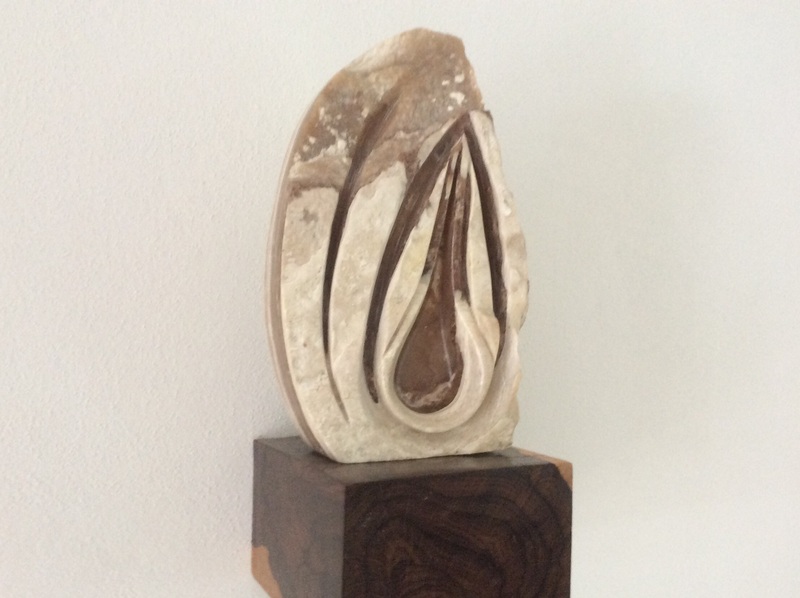 This is my favorite piece, carved from a stone found holding open a door in a small Yucatan hotel. Maybe its forever home is my yet-to-be built house, displayed with the perfect lighting in my living room . Abraham and Isabel sat with us at dinner last weekend. They wave when they see me out on my bike. 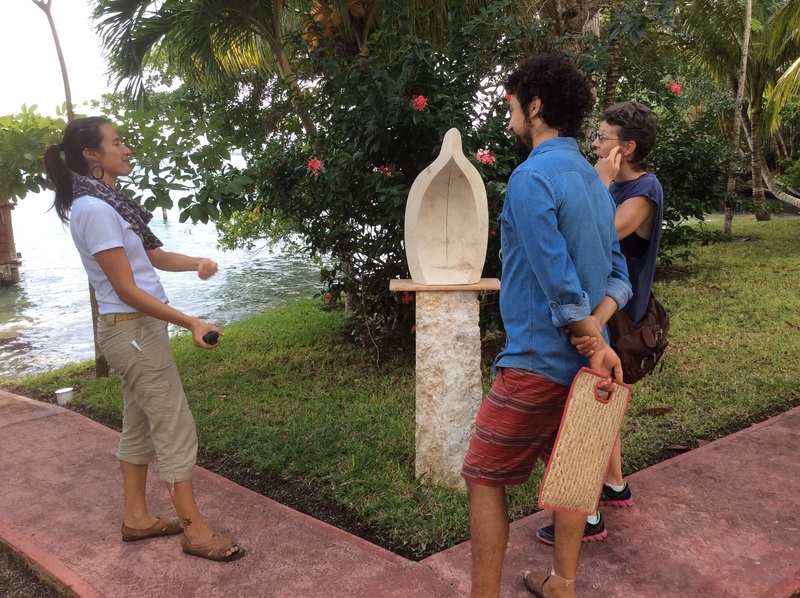 It has been really fun getting to know them and continuing to open my eyes to the artistry in Bacalar.